Ethnic Theme Address Plaque - - or religion theme plaque. Personalized home address sign with one of the following religious symbols or ethnic icons: Celtic cross, Latin cross, Orthodox cross, Greek cross, Fatima’s hand, Presbyterian, Hinduism Pranava, Buddhism Wheel of Dharma, Islam crescent, Jainism Ahimsa hand, Taoism ying and yang, Judaism Star of David, Sikhism, Pentacle, Christian ichthys Jesus fish. Made in USA. One-line address sign holds up to 4 characters and the ethnic or religious image you select. Two shapes: 16x11.75 arch and our 12x6 hybrid rectangle circle. The arch sign holds four (4) 3.5" characters with the symbol above the address. The rectangle circle sign holds four (4) 3.5" characters with the symbol on the left side. Note: the style number you see on the sample signs is for internal use only and is not on your custom sign. Made from sturdy and UV-stabilized 1/8" laminated acrylic with engraved personalization. Symbols, address, and border are permanently engraved into the sign during the production process. Border is the same color as the personalization and accentuates the shape of the sign. 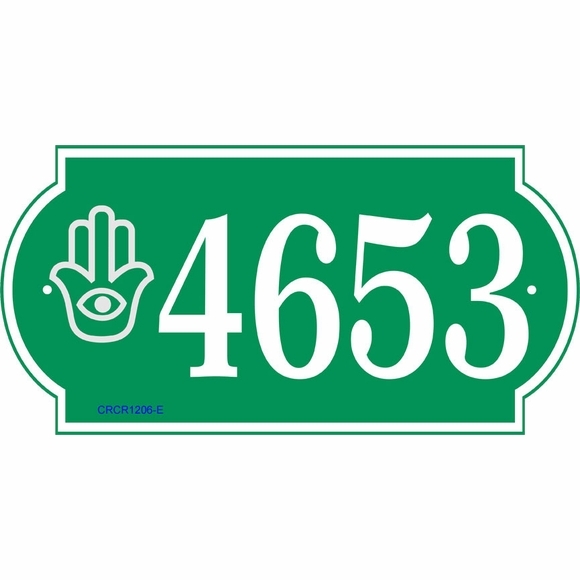 Personalized home address sign with a popular religious symbol or ethnic icon including Christian crosses and ichthys, Fatima’s hand, Hindu Pranava, Buddhist Wheel of Dharma, Muslim crescent, Tao(Dao) ying and yang, and Jewish star. Made in USA.